1x Ulanzi Phone Clip(Not including phone and other accessories). With 1/4" screw hole, can be installed to tripods, shoulder mounts, selfie sticks, stabilizer, handle rig, etc. 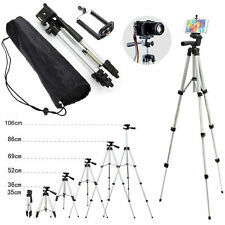 The smartphone, microphone and mini tripod showed in the picture are not included. 2.Built-in bubble level, making your tripod perfectly leveled. 1 x Tripod. With grip for adjusting head position. iPhone X, 8, 8plus, 7, 7plus, 6s, 6 6s /6plus ,5s, 5c, 5, 4s, 4. Samsung Galaxy S8, S8 , S7, S7 edge, S6,S6 edge,S5, S4, S3, Note5 Note4, Note 3. UPGRADED DESIGN – Now features an upgraded tighter ball joint! Improved grip to hold any phone in place! PORTABLE & VERSATILE – Take this mini tripod anywhere you go. Easily fits in your bag. The perfect travel companion! Nowhere to stand it? No problem! Get the perfect shot no matter where you are thanks to the unique flexible tripod design. Bend the legs on uneven ground or wrap them on a post. BONUS REMOTE – The included Bluetooth remote shutter means no more asking strangers to take a picture for you. A universal screw thread at the bottom for attaching this bracket to any regular sized tripod and monopod. tripod not included. 1x Universal BRACKET ADAPTER. padded with soft EVA for securing your iPhone in place and avoiding scratches to your iPhone. For Samsung. This Traveler Tripod with pan head design is the best choice for outdoor photograph activities. Maximum Tripod Load: 2.5kg (5.5Lbs). Built-in bubble level, making your tripod perfectly leveled. Mount connects to JOBY GorillaPods and oher tripods via 1/4"-20 thread. Able to adjust tilt angle. Designed for the most secure hold. Fits any model, with or without a case. Model No: 817024013899. And rotates for viewing and shooting photos or video in portrait or landscape mode. Maximum Tripod Load: 2.5kg. Built-in bubble level, making your tripod perfectly leveled. Head Type: 360° Swivel Fluid Head. iPhone 6s, 6 6s /6plus ,5s, 5c, 5, 4s, 4. With grip for adjusting head position. 360° swivel Smartphone Holder with 5/8" Tripod Microphone Stand Adapter for Apple iPhone 6s Plus 6 Samsung Galaxy S7 Edge S6 LG G5 G4 V10 HTC Droid by AccessoryBasics (Music Mic Stand Mount). Fully Adjustable, Fits Smartphones Such as Iphone 6s Plus, 6 as well as Samsung Galaxy S7 Edge S6 Note, LG G5 V10 and many others. Smartphone holder and tripod adapter allow you Mount your phone to a tripod easily! No tools are required. Universal Tripod Mount with 360º swivel thumb screw (¼ " -20) so it Fits on any Standard Tripod, Big or Small, Monopod or Selfie Sticks for Recording Video, Taking Pictures or to use Your Phone as a Webcam. Easily Attach Phone Mount w/Ball Head, or Other 1/4"-20 Parts. (Ball Head Phone Set). WHAT IT'S FOR - Quickly mount a phone to your DLSR, or tripod. Phone Mount is compatible with most devices up to 85 mm wide. ~Note:when you payment the item .you will choose two ways the ship way . Economy Int'l shipping have not the tracking number . �� Standard Int'l shipping have tracking number ,so that you can check your item all ship imformaton High Quality! Universal Mini 360 Rotatable Stand Tripod Mount Holder for Samsung Galaxy S5 S4 S3 Note 3 2 1 Bluetooth Remote Shutter for iPhone 6 6Plus 5 5S 5C 4 4S Samsung Galaxy S2 S3 S4 Note 2 3 . Identical to the Glif. iPhone 8 Plus, 8, 7 Plus, 7, 6s Plus, 6s, 6 Plus, 6. iPhone or tripod not included. Easily mount your iPhone to any standard tripod system. 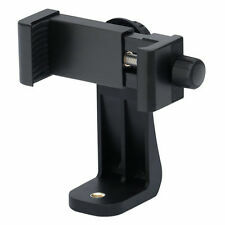 Stand and Tripod Mount for iPhone (Black) x 1. Puluz G1 is a compact professional smart gimbal for phones and gopro. Besides, it's made from high quality aviation alloy aluminum material which has a good appearance and touch-feeling. It is really valuable at its price. $GatorGrip Universal CellPhone Tripod Mount Adapter Holder For IPhone Samsung Galaxy Nexus The GatorGrip Universal Cell Phone Tripod Mount Adapter Holder is for iPhone, Samsung Galaxy, Nexus and many other cell phones not listed here. The holder is used on Tripod, Monopod, Selfie Sticks, Tabletop Tripod Stands and more. ---Cradle Design ---Compatible with Android, Windows, Blackberry and Apple Smartphones from 55mm to 85mm in width including case. ---Mount your iPhone 7, 6, 5 5C, 5S, Samsung Galaxy S5, S4, Note 4, Note 3 and more. 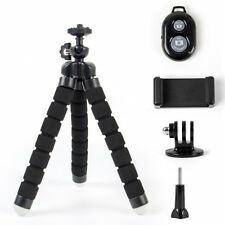 ---Manufactured with High Quality ABS Plastic, Foam backing, pliable Rubber protective grips prevents marring and scratching of phone ---Threaded mounting points available on both sides ---Will accept standard tripod and selfie stick with 1/4inch-20 threading ---Convenient, Easy to use and transport. The tripod legs is very Sturdy and durable,the legs will not fell off,unless is is crushed when. 1 x Sponge tripod. You will find the "AB shutter" to connect it. Universal phone holder Don't forget to turn off your Bluetooth remote,Saving Power is a virtue.